A crystal light bath is an energy healing treatment that uses crystals, color, light, and vibration. It heals all your levels: physical, emotional, mental, spiritual, energetic, and karmic. The bed has seven polished Vogel quartz crystals suspended above your seven chakras, or energy centers. Vogel crystals, cut to the teachings of Marcel Vogel, are specially cut to attract, amplify and transmit the Universal Light Force into your energy fields, including chakras and meridians. 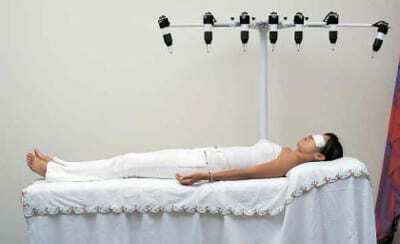 You lie face up on a massage table for the treatment, with your eyes closed and simply receive the energy healing while soothing music is played. How will a crystal light bath treatment help and support me? Your experience will be unique according to what you need. It is different session to session. You may feel deep peace, rest, and serenity. You might feel so relaxed that you fall asleep.You may experience heat, movement, tingling sensations or like you’re being “worked on” in different parts of your body. You may feel and release emotions. Memories, issues and patterns may arise. You might get insights, perspective shifts, understand soul lessons, experience expanded states of consciousness, other dimensions, and spirits working on you. What’s so important about crystals? What’s so unique about this treatment? Crystal light bath treatments are a portal for the Entities — Beings of Light and Love who work through John of God in Brazil — to heal you. Come with an attitude of openness and relaxed receptivity. You may want to prepare before with one or a few intentions, if you feel called to do so. When you begin the treatment, you might tune into and allow the energies to take you where you need to go. Even if you don’t “feel” anything, you will still receive from the treatment. $125 for 1 hour. Cash only. A maximum of one hour is advised per day.